Just like organizing anything else, the key to keeping toys organized is to ensure every item has its place. If there are kids living in your house, there are toys in your house. And you might have noticed, the toys just keep on coming. Birthdays, Christmas, grandma’s visits… Before long, it can feel like you’re living in a toy store, but without the organized shelves. To keep yourself from constantly yelling at your kids to clean up, there are a few simple organizational tips you can incorporate into your home to keep everyone happier. Your kids will learn good habits about cleaning up because they’ll know where everything belongs, and you won’t be shrieking in pain from stepping on yet another Lego. Often people buy bins and baskets for their toys, but have nowhere to put them. Every kid’s room or toy room needs a shelving unit. Then it’s simply a matter of filling the shelves with toys. 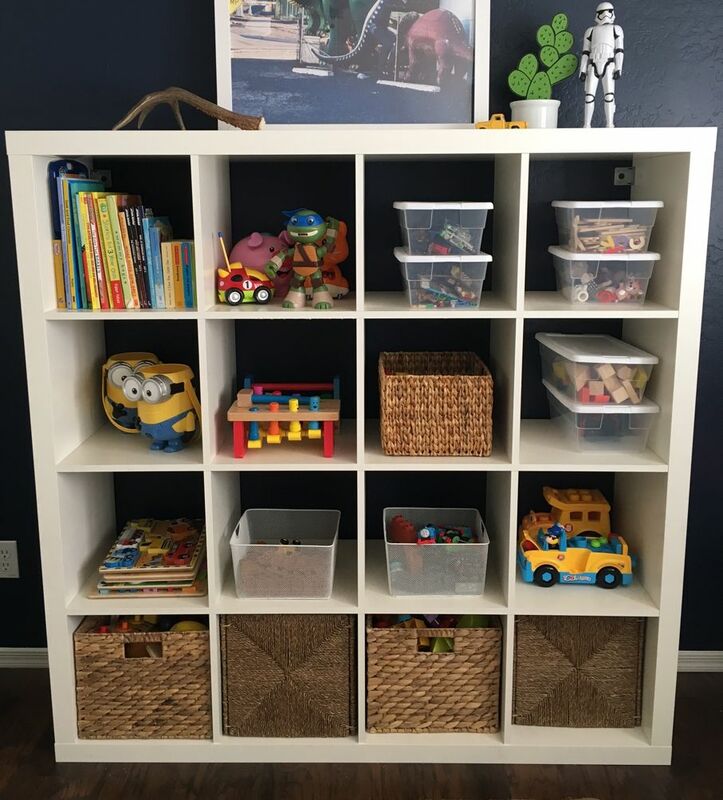 Using a combination of baskets, bins, and free-standing toys; you’ll be surprised how many toys a bookshelf can hold. Make sure your shelves are low enough for little hands to reach, and take the correct steps to securely bolt it to the wall. 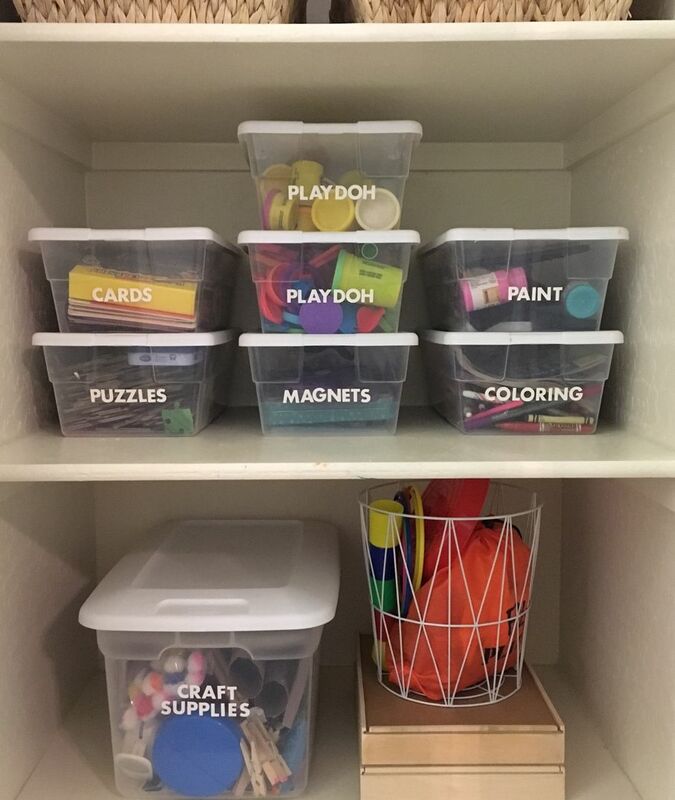 Use clear labeled bins for smaller messier items like craft supplies, puzzles, and cards. These bins are super affordable — available at stores like Walmart or Target for just a buck. Yes, you read that right: one dollar. These bins are durable, stackable, and easy to label. Try using removable letter stickers to label the contents. That way, if the bins need to be reused for a different purpose later, the letter stickers are easy to remove and replace. These are good bins to have tucked into a closet somewhere, and don’t necessarily need to be stored in the open in kids’ bedrooms. 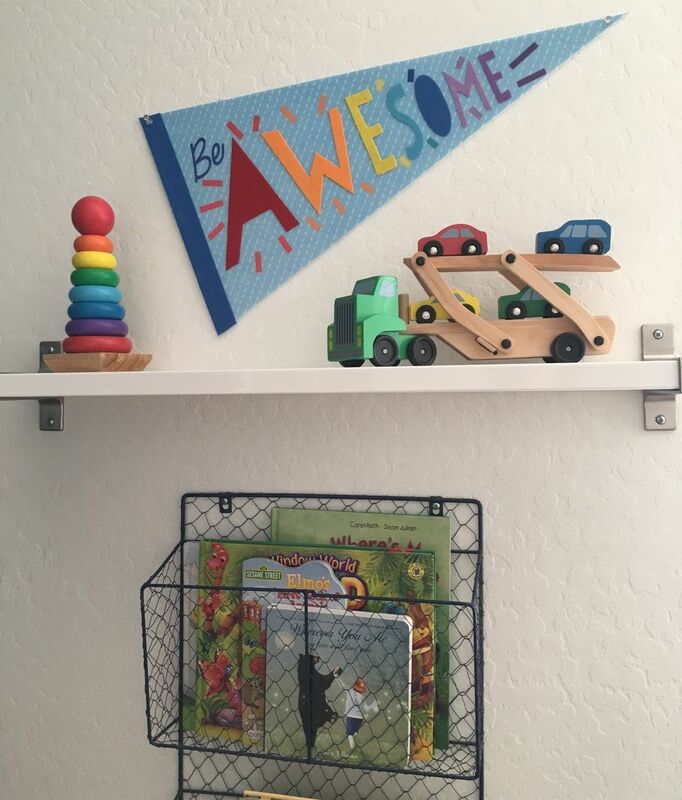 Even though some toys might no longer be played with by your kids, if they are meaningful – consider displaying them in your child’s bedroom as part of the décor. Chic wooden toys make for beautiful accessories that add color and whimsy to a room. The key to making a room feel more organized is to keep things off the floor as much as possible. That’s why wall shelves and wall baskets like this one are so useful. 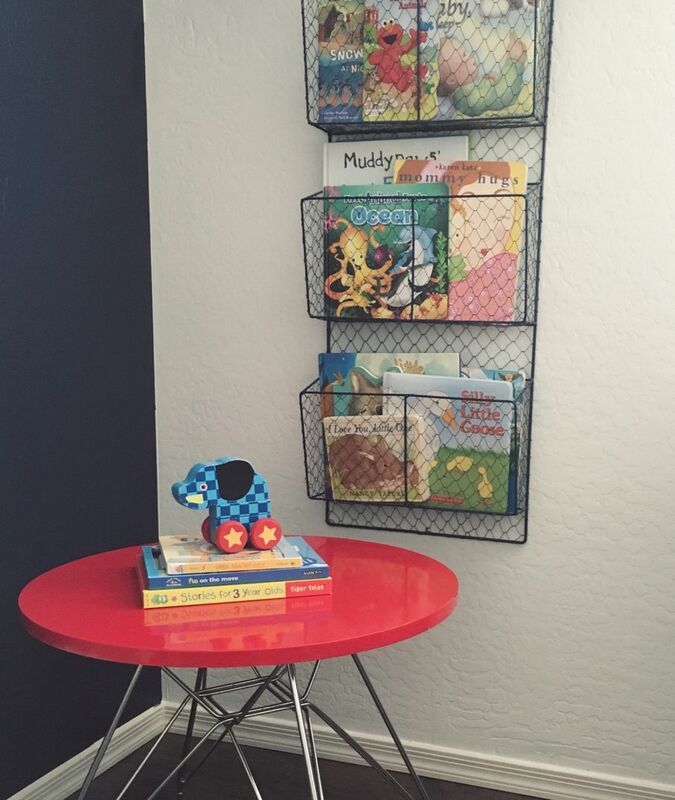 Try a wall basket for kids’ books. They’re easily- accessible for kids, and when done reading, kids can put the books back in the baskets all by themselves. Once you have your shelving unit and other toy storage centers set up, don’t let toys go beyond those stations. If there’s no room on the shelves for new toys, it’s time to get rid of some of the old ones. For every new toy that comes in, perhaps an old toy can be donated. Have your kids help you decide which toys they no longer play with, and use it as teaching moment about giving to others. Ready to get those toys under control? Just like organizing anything else, the key to keeping toys organized is to ensure every item has its place. If your kids have the proper systems in place, they’ll be much more successful when helping with cleanup time.